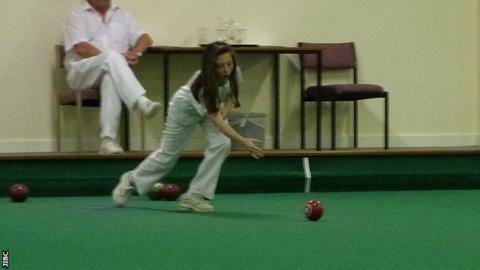 Jersey teenager Chloe Greechan has retained her World Indoor Bowls Council mixed pairs world title. The 15-year-old and partner Malcolm De Sousa beat Ireland's Chloe Watson and Andrew Kyle on a tie-break at Jersey's bowls stadium at Grainville. Having lost the opening set 8-7 they went on to win the second 7-6 before getting the better of the tie-break. Greechan won the mixed pairs title in 2015 when she partnered her father Tommy to victory in Jersey. "Winning a world title with your dad is quite special, but to prove that you can win it with someone else is good," Greechan told BBC Radio Jersey. "It's not been done back-to-back before at my age, so to do that first time in my second world event is special." Teams from England, Scotland, Wales, Ireland, the Netherlands, Jersey, Guernsey and the Isle of Man were competing in the event.